Henry Snee led the way with four goals, while Sam King netting a brace and Jake Renney once against a lone Blue Cross reply via Ben Chrystie. Second place Cranfield United also hit seven in a 7-1 victory at Wilstead. Courtney Boughton weighed in with four goals and was joined on the United scoresheet by single goals from Delroy Phillps, Daniel Green and Connor McBrein against a lone Wilstead reply from Jamie Hall. In fourth in the Premier Division supported by Sportsform are Stevington who also netted seven in a 7-0 home win over Ickwell & Old Warden to extend their unbeaten home ways to five games. Ben Walsh led the way with a hat-trick, Billy Pinney adding a brace to go alongside single goals from Kieran Souter and Billy Roberts. Just goal difference behind them in fifth are Crawley Green Reserves who ran out 4-2 home winners over Caldecote. Callum Yates netted a brace to go alongside single strikes from Tim Akerele and Tom Barnett against Caldecote replies via Callum McCoy and Aaron Kersey. Making up the top six are Queens Park Crescents who, following three straight away defeats, returned to winning ways on the road with a 4-0 victory at AFC Oakley M&DH. Jamaine Ivy with a brace was joined on the Crescents scoresheet by single goals from Daniel Rasol and Shahiaur Rahman. Just a point behind the Crescents in seventh are Marston Shelton Rovers who won 3-2 in a game at AFC Kempston Town & Bedford College where the hosts missed two penalty kicks, Nick Skolsky netting twice and Dale Maiciw once for the Rovers against Town goals from Mike Stephenson and Wes Lewis. Whilst also enjoying life on the road were Riseley Sports who, with a single goal from Jay Willett, won 1-0 at Flitwick Town. League leaders Bedford Albion are now unbeaten in their last seven outings after sharing the spoils from a 1-1 home draw against Cople & Bedford SA. Jesse Sidhu netted for the Albion with Akeem Lendor replying for the visitors. Their lead was cut by two points after second place Bigglewade FC Reserves extended their unbeaten sequence to 12 games with a 3-1 home victory over Henlow. Cian Coles, Johnny Bannister and Ollie Lee saw their goals only replied to once by Chris Reeves for Henlow. For third place Cranfield United Reserves it was home win number five on the bounce with a 7-1 victory over Lea Sports PSG. Jordan Conway led the way with a hat-trick, Joe Sames netting twice including one from the penalty spot alongside single goals from Liam Whitney Craig and Patrick Lawrence. The lone PSG goal came from James Noonan. Fourth place Wixams were 3-2 home victors over Totternhoe Reserves, Danny Butler netting twice and Charlie Battams once against Totts replies via Pearce Tracey and Callum Horgan. In fifth are Shefford Town & Campton Reserves who took their unbeaten run to five games with a 3-0 home victory over The 61 FC Luton Reserves. George Mcgonagle, Ashley Ingham and Jack Dryer netted the goals to do the damage. Wilstead Reserves returned to winning ways for the first time in 11 games when winning 2-1 at Sandy who have now lost their last 11. 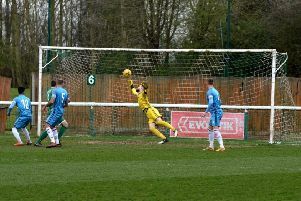 Robert Lilley and Robert Booth were on the Wilstead scoresheet against a lone home reply via Lee Hunt. Having both won their last two outings, Flitwick Town Reserves and AFC Kempston Town & Bedford College Reserves each failed to make it three wins on the bounce when sharing the spoils from a 0-0 draw. We now have new leaders at the head of the Division Two supported by Hy-Pro standings in the shape of Elstow Abbey who came from behind in a 2-1 home victory over Black Swan ( Luton) Ashley Gardener shot the Swans ahead before goals from Glenn Tumulty and Dan Jeffries won the day for the Abbey. The Abbey took over top spot on goal difference from Houghton Athletic whose unbeaten home record and 12 game unbeaten run was ended by Meltis Albion who now sit in fourth after winning 2-1. Sean Canavan and Davion Anderson were on the Albion scoresheet against a lone Athletic goal via Petru Ciochina. 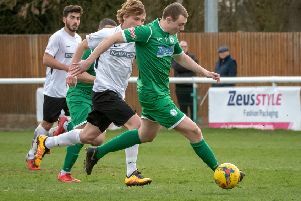 The Albion took over fourth from Kempston Athletic who were beaten 6-2 at St Joseph ( Saturday) Pat Daly led the way with a hat-trick to go alongside single goals from Joe O’Reagan, Jack Thompson and Simon Richards against Athletic replies via Gary Whitbread and Jordan Nice. Whilst for sixth place Sporting Lewsey Park it was win number five on the bounce in claiming a 4-3 victory at Sundon Park Rovers. Chris Gibson with a brace plus single goals from Luke Lincoln and Jonathan Barnett outweighed home strikes from Rayvaun Bridgett, Ethan Tenn and Oktay West. Also enjoying life on the road were Luton Leagrave AFC who won 3-0 at Marston Shelton Rovers Reserves. Goals from Nico Covileac, Tony Clark and Hartley Coleman did the damage. Alas not also for AFC Oakley M&DH Reserves who saw their three game unbeaten run ended when beaten 5-4 at M&DH Clapham Sports. Owen Tuffin with four goals and a lone strike from Phil Kempsell brought up the home nap hand against M&DH Replies via a Joe McDonagh hat-trick and a single goal from Paddy Enwright. Clifton were 4-0 home winners over Caldecote Reserves. Michael Hall, James Hannan, Greoge Dee and Jose Carles all found the back of the net. CS Rovers made it five home wins on the bounce in defeating Unite MK Reserves 4-2. Sean Morrision with a brace was joined on the Rovers scoresheet by Daniel Bhatti and Shane Robb against MK replies via Jason Hart and Prince Mukolonga. Leaders Pines (Luton) retained their 100% home record with a 9-0 victory over Square FC to take their goal tally to 102. Ryan Smith netted six times and was joined on the Pines scoresheet by single goals from Garry Duncan, Damien Fields and Alan Morris. Second place Real Haynes, who trail The Pines by 14 points, were 1-0 home winners over third place Bedford Albion Reserves thanks to a goal from Ben Worbey. For fourth place FC Polina (Luton) it was a 3-0 defeat at Thurleigh who now sit in sixth but with at least four games in hand on all the teams above them so are right there in the promotion mix. Bradley Raines, Alex Horn and Isaac Jones netted the goals to do the damage. Whilst fifth place Shefford Town & Campton A were beaten 3-0 at Harlington Juniors who were chalking up home win number six on the bounce thanks to a Nick Buttigeig hat-trick. Dinamo Flitwick returned to winning ways with a 3-0 home win over Real Haynes Reserves, Dale Goldie netting twice and Thomas Mallams once. Whilst Stevington Reserves claimed the only away win of the day in winning 3-1 at Lidlington United Sports whose lone goal came via Mark Reynolds. Meantime the Wootton Village v Wixams Wanderers game will be subject to a Beds FA and league inquiry after being abandoned two minutes from time following a third red card of the day for a Wixams player. The Village at the time led 2-0 via goals from Ben Hall and Chris Clark.